MN Colibri arrives off the French Guiana coast at the conclusion of its trans-Atlantic crossing with Ariane 5 launcher elements for Flight VA229. 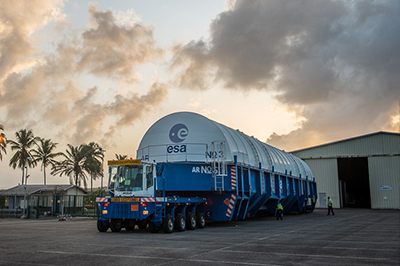 The first 2016 delivery of an Ariane 5 to French Guiana for Arianespace’s busy mission manifest this year has occurred, with elements of the heavy-lift vehicle arriving for an early March launch of Eutelsat’s EUTELSAT 65 West A relay satellite. After being unloaded from the MN Colibri sea-going ship at Pariacabo Port, Ariane 5’s core cryogenic stage for Flight VA229 is readied for the transfer by road to the nearby Spaceport. Completing a trans-Atlantic sea voyage from Europe, the Ariane 5’s stages arrived aboard the MN Colibri – one of two roll-on/roll-off transport ships that support Arianespace’s supply chain. The MN Colibri docked on Tuesday at Pariacabo Port adjacent to the city of Kourou, followed by the components’ unloading and transfer by road to the nearby Spaceport yesterday. Arianespace’s mission with EUTELSAT 65 West A is one of up to eight Ariane 5 liftoffs planned for 2016 – which would mark a new annual record for this workhorse launcher. The March launch is designated Flight VA229 in Arianespace’s numbering system, signifying the 229th mission with an Ariane vehicle since the family of European rockets entered operation in 1979. Flight VA229 will follow Arianespace’s year-opening Ariane 5 mission – Flight VA228 – scheduled for January 27 to loft Intelsat’s Intelsat 29e. Ariane 5s are supplied by prime contractor Airbus Safran Launchers, with Arianespace taking responsibility for the payload integration and launch operations at the Spaceport. Overall, Arianespace is targeting up to 11 flights in 2016: as many as eight with Ariane 5, along with two liftoffs of the lightweight Vega, and one utilizing the medium-lift Soyuz. Download a larger version of this story’s photos in the Gallery.